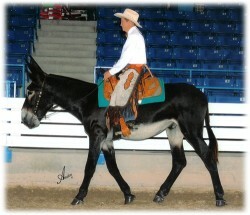 A top shelf halter donkey this Clyde son was eye candy for any donkey admirer. 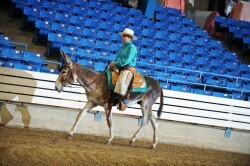 Prince was a NASMA Reserve Champion End of Year High Point Donkey, Prince ran the gamut from Halter, Western, English, Driving and Gymkhana. Now he is building many beautiful mules and donkeys. Ethan is a very tall character with a very great life, living with Skip and Cheryl Metheny at Four M Farm. He turned out to be a driving fool with a road trot that could blow your wig back. 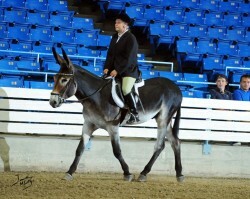 Jackson was a true giant among donkey's. His disposition and true blue character made him on a level all his own. My dear Jackson, may you rest in sweet peace. Gato El Rey is living proof that genetic selection works. By marrying the families of Dr. Aaron's Old Hickory line with Hollyfield's Farm Joshua line, great things can and did happen. 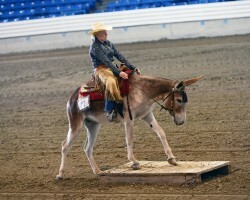 If all my donkeys come out like this guy, I'll be a very happy donkey farmer.